Where Will the Property Market Go in 2013? It’s that time of the year where we sum up what happened in 2012 and peer into 2013 to divine where the market may go. While I’m not a fan of forecasting (the type that says “the market will fall by 5% in the second quarter”) because I believe that the future is not knowable with any certainty, I do think it’s important for investors (and really anyone looking to buy a sell a property) to take stock of where we are in the market cycle and analyze the factors that affect the supply and demand of property to make a good decision. We had two additional rounds of property control measures by the Government in September and October 2012, aiming to cap the proliferation of shoebox units and tighten mortgage financing respectively, bringing the total measures to six since the first round in September 2009. Have the measures worked? Well to some extent, yes. 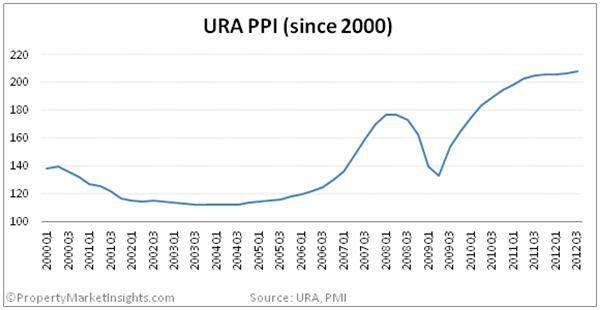 The URA Property Price Index (PPI) has risen by a muted 1.0% in the first three quarters of 2012 versus 5.6% over the same period in 2011, so the upward acceleration in prices has been halted. But prices are at a level that many feel are too expensive and unaffordable, thus breeding some discontent. The other standout trend in 2012 was the spiraling out of control of industrial property prices. In 3Q2012 the Industrial Property Price Index registered a stunning 8.8% quarter-on-quarter growth to hit 183.3, an all-time high, the twelfth quarter of growth. The Industrial Property Price Index has already risen by 26.7% in the first three quarters of 2012, and an astonishing 102.8% since 3Q2009, versus just 34.9% for the residential PPI over the same period. Industrialists with thin margins are going to have a tougher time funding their real estate needs. The URA has collated that a total of 93,800 private housing units (including about 9,800 EC units) that will be constructed over the next few years, with about 43% or 40,000 of those (including 3,400 EC units) still yet to be sold. 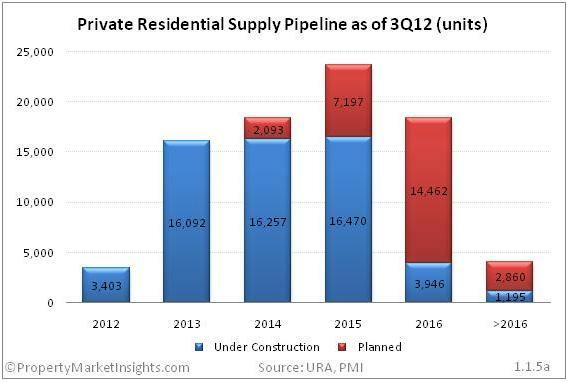 Based on the URA data collated by PropertyMarketInsights.com, residential completions will peak in 2015 at 23,667 units based on the private residential supply pipeline, or a 47% increase over the completion expected in 2013. Despite this, the government has kept the land supply relatively constant (at least so far based on the 1H13 Government Land Sales Programme), perhaps in an effort to prevent the perception of a squeeze in the supply of land that could lead to higher prices. While the large increase in supply sounds scary, it is worth pointing out that demand has been very strong for the past few years, and has continued to be strong so far this year as well. Year-to-date till November 2012 there has been an estimated total transaction volume of 37,597 units, comprising 24,970 developer and 12,627 secondary sales (Figure 1.1.5b). This is 118% of the annual average of 31,826 units. If demand going forward continues to be as strong as it has in the past couple of years then the upcoming supply could well be absorbed without any weakness in the market. The standard argument I hear about why property prices will continue to stay high is due to the abundant amount of liquidity and current low interest rate environment, thanks to a trigger happy Fed whose new mission is to protect high prices by flooding the market with dollars via Quantitative Easing every time there is any sign of weakness. I completely agree that a low interest rate environment is supportive of property prices, and with interest rates close to zero, borrowing money to reach for yield sounds like a rational idea. The problem is that given we’ve had interest rates hovering close to zero for several years now since the Global Financial Crisis, many people are starting to believe that interest rates will be low forever. Well, my friends, forever is a very long time, and if there’s one thing I’m certain about, it is that interest rates will not stay low forever. Do remember that the current low interest rate environment is an abnormal situation, one put in place to support a weak growth environment in the Developed World. Behaviorally, we human beings tend to extrapolate the current situation into the future, but markets don’t work like that. 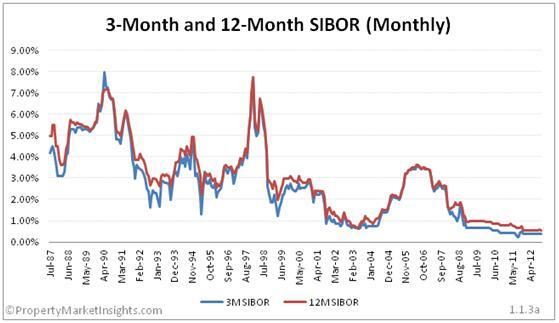 What could possibly happen to reverse the low interest rate environment? One possibility is a recovery of US growth. Another is a spike in inflation. In the 1970s the US was plagued by a combination of spiraling inflation and weak economic growth, otherwise known as stagflation. It took a strong Fed chairman by the name of Paul Volcker to beat the inflation monster, but at the cost of a recession, and he did it by hiking the federal funds rate rates to a peak of 20% (!) in June 1981. If that happens again, it will certainly be a disaster for property. As members of PropertyMarketInsights.com know, we are currently in the Late Bull stage of the Property Market Cycle Model, when property price increases start to slow down after a steep run up during the Early Bull Market Phase, and is an indicator that we are nearing the peak of the cycle. In other words, the downside risk is greater than the upside, and anyone thinking of buying a property now should be very cautious when doing so. Mr. Propwise is the author of Timing the Property Market. Posted courtesy of www.Propwise.sg, a Singapore property blog dedicated to helping you understand the real estate market and make better decisions. Click here to get your free Property Beginner’s and Buyer’s Guide.